The process of change is often about stepping up and into new ways of thinking, being and relating. It’s about stepping up for our integrity. Here’s how. Early evening, light’s beginning to fade as we set out for a walk after dinner. The thought’s going back and forth in my mind as we wander the familiar pavements. It’s been there a while, a dawning realisation of sorts – as I’d ventured off the traditional path career wise. But dare I express it – let it take form outside of me. I mean if I’ve realised it internally what’s the value of expressing it to another? I need to say YES to me. I need to trust in me and my skills, and not give myself such a hard time. It all related to TRANSITIONS. Transitions to new spaces – to new ways of being and relating for me. the moments when we’re poised to break through our business as usual ways of thinking and being. At these Break Through moments we can often get the jitters, and hesitate or retreat to what’s familiar – rather than push through the fears, doubts and uncertainty. And my partner is well and truly onto it. He comments that as I’ve become clearer, more focused and more sure about the next stages (of my journey) I’ve started to pull back, to slow down. Yep it’s the jitters for sure, I think. Jitters about transitioning into a space I’m unfamiliar with; a space that requires new ways of being, thinking and relating. Saying Yes to Me is about stepping up and into this new identity of sorts. And that can be scary. Here’s three situations to illustrate my point – plus some tips along the way. furiously scanning the car-park around me, nervous about who might see US together. It’s late afternoon. The students are all gone, and I’m waiting for my male partner to drop my spare car keys at school. I’m an English Language Learner (ELL) teacher at the time, working in a religious school. It’s been brewing quite a while – the toll of covering up and pretending or silencing and self-censoring. I needed to say YES to ME – Yes to embracing who I am. Embracing my partner and the life we’d created together. I needed to say YES to finding ME – by BEING ME more fully. I needed to say YES to stepping up more fully into my identity as a gay man. Embracing, digging into, and connecting to the history, the culture, the language and life-worlds of my people. And in doing so…. well there’s no looking back. Round that block. Round that block I go once again. How many times I have done it now? Each time I get within striking distance, the voices within, the fears, the doubts seem to furiously conspire. Each time as I get centimetres closer, I quickly cross the road studiously avoiding looking at THAT door entrance (It may as well be a guarded fortress). It provides mere moments of respite though – as I once more set off around the block – reliving the moments that have gotten me here. In a new country that I’ve come to – to find me and Live more fully as me. What will it take for me to step up – to walk through that entrance – to say YES to ME? What will it take for me to truly own and speak my Voice – and refuse ever-more the hiding, the shame, the stigma? Feeling a weight that felt like no other – lift from me. 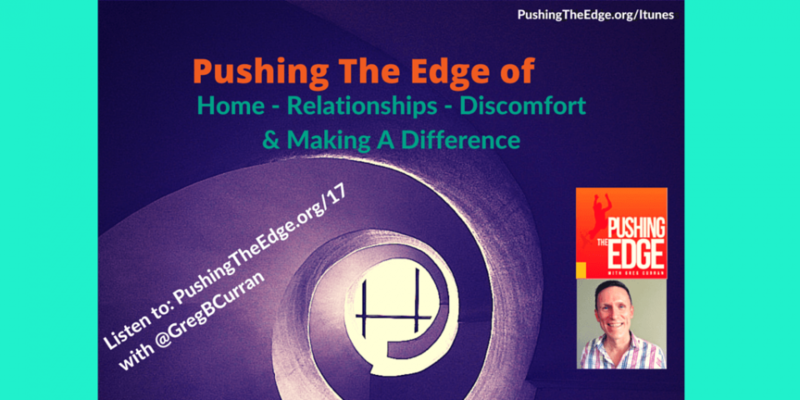 Was about honoring ME – stepping up and into who I am – no matter how #$!! ** frightening it was for me. And in so doing, I opened up possibilities that I’d never envisaged possible for ME. I nourished that part of me – that had been so neglected – refused light and air. And in doing so….well there’s no looking back. It’s funny isn’t it, you’re thinking about something, and then TA-DAH!! Someone expresses just what you’ve been pondering. It gets me thinking about having confidence in self, in our voice. It gets me thinking about stepping up and into new worlds of being, thinking and relating. @GregBCurran thanks Greg. It’s really about building mastery & confidence in any new arena. An identity shift! Yes Indeed. Taking on and stepping into a new, unfamiliar subjectivity can challenge us and confront us. Maybe it’s a voice that outside our world experience – that’s new and unfamiliar – that we’re growing into. knowing that we have done it before (in other arenas) – and can do it again. Standing Up for Voice is a critical aspect of what makes me tick. 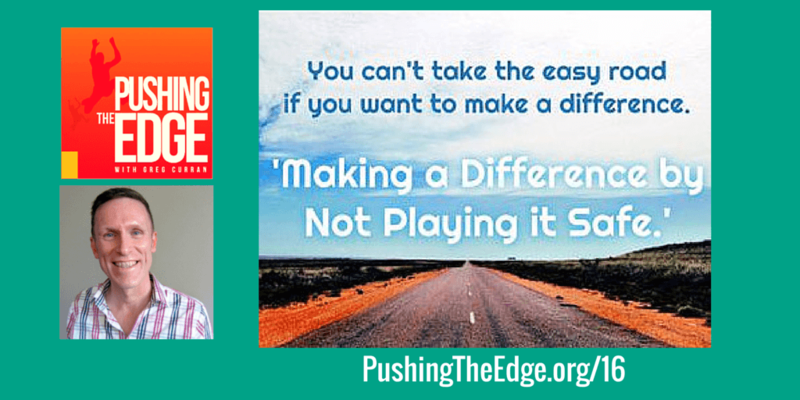 Listen to my thoughts about Voice, the big challenges in Education, and about how we can make change happen at a local level in Episode 17 of Pushing The Edge Podcast. I am inspired by your honesty and courage. Love your list of what’s crucial to remember when undergoing change. Thanks so much Victoria – really good to know that this post resonated. I think being part of a supportive PLN really encourages me to step up. Powerful words Greg…I can relate. I’ve questioned myself, contemplated giving up on my pursuit in leadership, and have had too much negative self talk. Thank you for your honesty and realness. You have been such an encourager for me..don’t give up on being you. Really appreciate your support Melissa – as well as your passion for education that cuts through – can’t wait to see what the future holds for you. Thanks a lot.